Method to convert text from one type to another. Method to search dictionaries for the conversion candidate, if there are multiple candidates, it will return first one. This is for the conversion in non-interactive mode. aText Text string to be converted. Locale Locale the conversion is referring to. 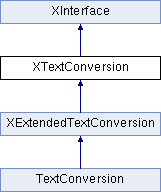 nTextConversionType One of TextConversionType values. nTextConversionOptions Combination of TextConversionOption values. NoSupportException when nConversionDictionaryType is not known by the implementation, or when the locale is not supported. Method to search dictionaries for the conversion candidates. Method to query if the conversion type should be interactive or non-interactive mode. TRUE if the entry is a valid entry for the dictionary FALSE otherwise.